Barcelona made it two draws in as many games as they were held to a goalless draw away to Atheletic Bilbao on Sunday night. 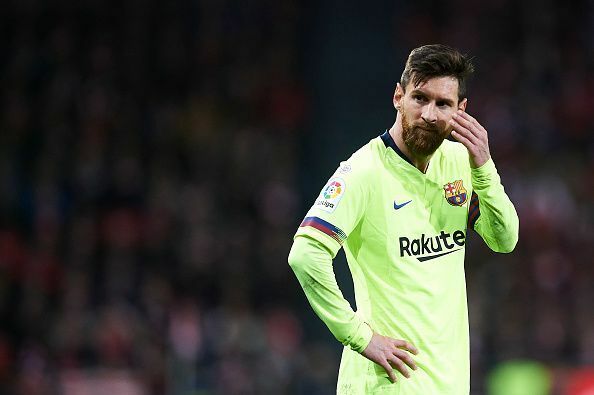 Ernesto Velverde’s charges who were coming off a 2-2 draw at home to Valencia last weekend could not get past Iago Herrerin in Bilbao’s goal despite Captain Lionel Messi striking the upright in the first half. The result means that Barca’s lead atop the La Liga is now reduced to six points going into the final 15 games of the season. The team that is now hot on Barca’s heels is none other than eternal rivals, Real Madrid who were 3-1 winners over Atletico on Saturday afternoon. Real who have now won all their last five league games started brightly with casemiro putting them in front on 16 minutes. Atletico’s talisman Antoinne Griezmman eqaulised 10 minutes later before Sergio Ramos converted from the spot on 42 minutes to ensure Santiago Solari’s men are infront by halftime. Despite relentless pressure by the home side as they tried to find an equalizer, Gareath Bale struck with 16 minutes to play to seal a 3-1 victory for Real and hand his side the bragging rights of Madrid for the mean time. Real now move onto 45 points, six behind leaders Barcelona. For Atletico, they slip into third with 44 points from 23 games. Elsewhere, fourth placed Sevilla came from two goals down to salvage a point at home to Eiber on Sunday. The visitors where 2-0 up by the 63rd minute as Fabian Orellana and Charles both found the back of the net. However, despite seeing Ever Banega given his marching order on 65 minutes, Sevilla struck two late goals through Ben Yadder (88) and Pablo Sarabia (90+2) to ensure the game ended all sqaure. Sevilla are still fourth on the standings with 37 points, 14 points off the pace. In the other La Liga games played on the weekend, Getafe, Leganes, Espanyol and bottom side-Huesca were also victorious. Getafe defeated Celta Vigo 3-1 at home, Leganes were 3-0 winners over Real Betis, Espanyol scrapped to a 2-1 victory at home to Rayo Vallecano while Huesca overcame Girona 2-0. In Italy, Juventus resumed normal duty with a comfortable 3-0 victory away to Sassoulo on Sunday evening. 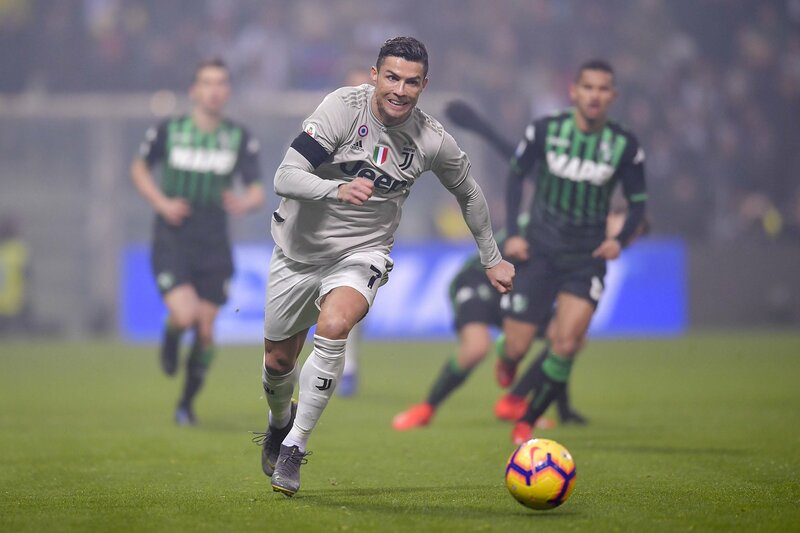 Sami Khedira, Cristaino Ronaldo and Emre Can were all on target for the Old Lady who now move back onto 11 points ahead of second placed Napoli having gathered 63 points from 23 games. For Napoli, they were held to a 0-0 draw away to Fiorentina on Saturday evening, in a match that they have themselves to blame after missing a host of chances. AT the Stadio Ennio Tardini, Inter Milan required Lautaro Martinez’s lone strike, 11 minutes from time to overcome a spirited Parma side 1-0. Inter who had failed to win any of their last three League games remain third on the standings with 43 points, four ahead of fourth placed Milan who comfortably defeated Cagliari 3-0 at the San Siro. Milan’s goals were scored by Krzysztof Pitek, Lucas Paqueta and an own-goal off Luca Ceppitelli’s foot. All the other top six teams won their respective fixtures in the Serie A. Roma took care of Chievo 3-0 on Friday, Atalanta came from a goal down to defeat SPAL 2-1 at home while Lazio overcame Empoli 1-0 on Thursday. The other big winner in the Serie A was Frosinone who shocked Sampdoria 1-0 at the Stadio Communale Luigi Ferraris, thanks to Daniel Ciofani’s 25th minute strike. In Germany, Borrusia Dortmund’s lead at the top of the Bundesliga was cut to 7 points following their 3-3 draw at home to Hoffenheim. Lucien Favre’s side blow a three goal lead with only 15 minutes to play and in consquence, draw a second League fixture in as many games. 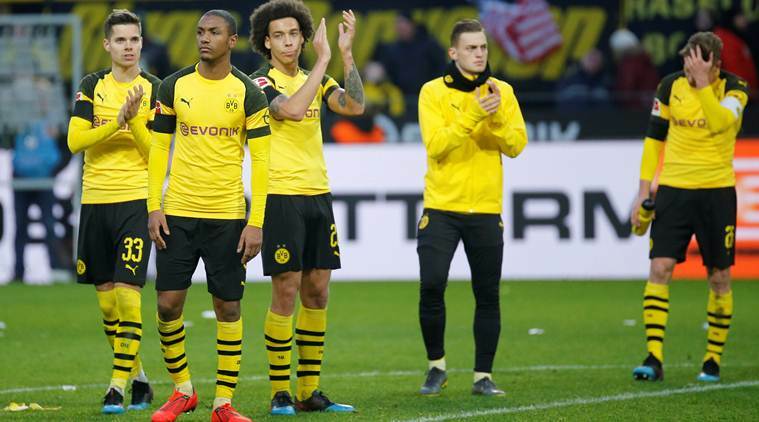 Coming off a 1-1 draw at Frankfurt, Dortmund led by 3 goals to nil inside the opening 66 minutes with Jordan Sancho, Mario Gotze and Raphael Guarrero all on the score-sheet. However, they concede three at the other end, Ishak Belfodil (*2) and Pavel Kaderabek both on target for the visitors. As a result, Dortmund are now just 7 points ahead of Bayern Munich who defeated Schalke 04 3-1 at the Allianz Arena on the same day. The Bavarrians took the lead off Jeffery Bruma’s own goal and despite the visitors leveling through Ahmed Katucu, Robert Lewandowski and Serg Gnabry struck in the second half to seal all three points for Robert Kovac’s side. The shock of the weekend was witnessed at the Borrusia Park as Monchengladbach were walloped 3-0 by visiting Hearth Berlin. Ondrej Duda, Solomon Kalou and David Salke were the scores for Hearth who had failed to win any of their last two League games prior to Saturday. Elsewhere, Hannover snapped a four game losing streak, overcoming Nurnberg 2-0 at the HDI Arena. The trio of Leverkusen, Fortuna Dusseldorf and Bremen were also victorious in their respective fixtures. Leverkusen were 5-1 winners away to Mainz, Bremen defeated Augsburg 4-0 while Dusseldorf overcame Stuttgart 3-0. In the French Ligue One, PSG returned to winning ways thanks to a 1-0 win over Bourdeaux on Saturday. 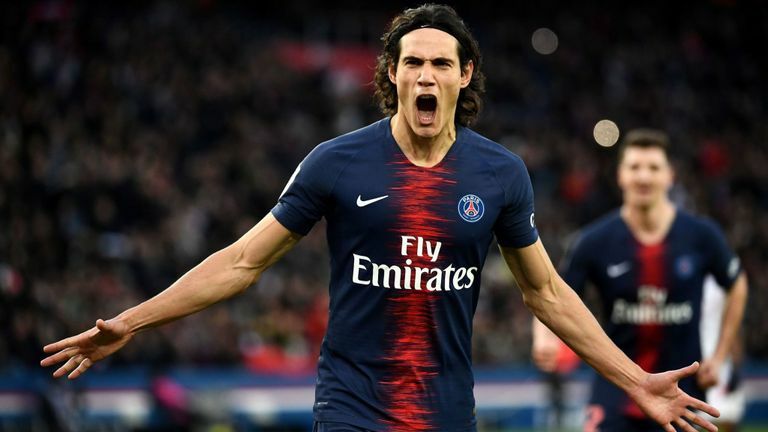 Edison cavani who would later be forced off the pitch with a serious injury struck the winning goal on 42 minutes off a penalty kick to ensure the Capital side remains 10 points ahead of Lille in the standings despite having played two games less on Christoph Galtier’s side. For Lille, they continued their fine run of form, winning 2-0 away to Guingamp on Sunday. Rafael Leao and Loic Remy scored the goals that ensure Lille have now won all their last five league games. At the Stade de la Baeujoire, home side Nantes defeated Lyon 1-0 on Sunday night thanks to a Remi Walter penalty on 69 minutes. Olympic Marseille where 2-1 winners away to Dijon on Friday night. Mario Balloteli and Lucas Ocampos were the heros on the night as they canceled out Jordan Marie’s opener on the 18th minute. Elsewhere, Rennes, Nimes and Angers were also winners over the weekend. Nimes overcame Nantes 4-2 away from home, Rennes were 3-0 winners over St. Ettiene while Angers scrapped to a 2-1 victory over Strasbourg.